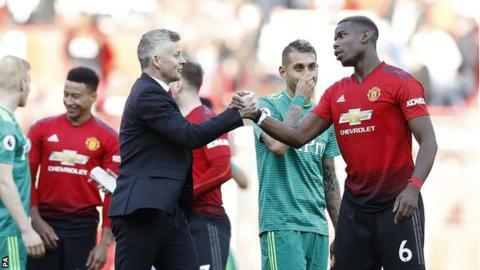 Pogba described the Spanish giants as "a dream club for every player" while on international duty with France, and Real boss Zinedine Zidane has said he likes the 26-year-old "a lot". But Solskjaer said on Monday: "He didn't talk about himself. "He said anyone would like to play for Real Madrid." "Paul is happy here, he's playing well," said Solskjaer. "He's going to be a big, big part. You like to build your team round him and that hasn't changed at all." Fourth-placed United go to Wolves in the Premier League on Tuesday (19:45 BST kick-off) and Solskjaer confirmed striker Romelu Lukaku is fit to return following a foot injury, as is forward Anthony Martial, who picked up a knock in Saturday's home win over Watford. On Thursday, former United striker Solskjaer signed a three-year contract at Old Trafford having been interim manager since Mourinho's dismissal. It is the second time he has managed in the Premier League following a brief spell at Cardiff City in 2014, during which the Bluebirds were relegated to the Championship. "When I had my failure at Cardiff I thought my dream of this job would never happen, then when they rang before Christmas I thought: 'It's six months and I'm going to enjoy it,'" said the 46-year-old. "I felt happy, comfortable and thought I had something to add to the club. I started to think maybe I could do it. "I want to be part of this club long term." Solskjaer brought in Mike Phelan as his assistant when he arrived in December. Phelan, who served in the same position under Sir Alex Ferguson at United, is still contracted to the Central Coast Mariners in Australia - but Solskjaer wants him permanently at Old Trafford. "I am sure things will get sorted very soon," he said.